Southwest Georgia is erupting with halfback fever as Floridians continue to look north to escape hurricanes and their economic ramifications, such as high taxes and insurance rates. It’s a somewhat unexpected economic jolt, but leaders in this traditionally slow economy will take what they can get: Retiree growth has many advantages, increasing a tax base that has been decimated by layoffs and plant closings, and improving school systems in many poor areas. Zorn credits a new spec building built for the site with bringing new tenants on board. “Hawaiian Fiberglass manufactures pools, and they’re the third largest in the nation. They’ve been distributing from here and now they’ll begin manufacturing. 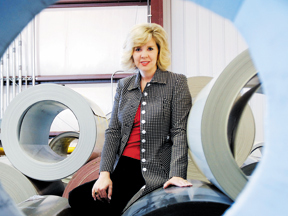 We expect up to 60 new hires in the next year,” she says, adding that McElroy Metal has opened its 10th location nationwide in the park last September with 30 employees. Currently the company is gearing up for a second shift to add 75 workers, and has plans to bring on 125 more later this year. Sims also reports industrial growth in Thomasville, which will announce more than 1 million square feet of expansions and relocations, including Hurst Boiler and Welding and Siemens Water Technolo-gies. Brooks County has ac-quired 250 acres for a new industrial park. Southwest Georgia’s towns boast unique charms. Bainbridge sits alongside Lake Seminole, Moultrie has become a cultural center for performing arts and recently restored its courthouse, Thomasville has a Black Heritage Trail and Valdosta is home to Wild Adventures Theme Park. Southwest Georgia’s largest city, Albany, which has already invested $30 million in its Flint Riverquarium, is investing an additional $1 million from SPLOST funds to create a “Theater in the Trees,” further boosting its status as a regional center. A River Trail system is being extended; the northern branch will link to the 700-acre Parks of Chehaw (including the 100-acre Chehaw Wild Animal Park, designed by Albany native Jim Fowler) and south to the Radium Springs area. The county will also invest Special Purpose Local Option Sales and Use Taxes to develop a 20-acre site adjacent to Skywater Creek by the Flint Riverquarium to build gazebos and botanical gardens. “It’s a very exciting plan – just thrilling,” says Tim Martin, President/CEO of the Albany Area Chamber of Commerce and Economic Development Commission. “The future of our tourism is very bright. And our retail is already incredibly strong – over $2 billion in annual sales.” One of the biggest engines fueling retiree growth is Albany’s Phoebe Putney Memorial Hospital, which employs 3,800. The facility added 26 physicians this year and has spawned growth in other health-related sectors. Hamilton Relay, which provides phone services for the hearing-impaired using typed messages, recently announced it would locate in an Albany strip center and employ more than 100. “Another thing we’re seriously pursuing is a 20-year project: a new interstate. The Georgia Department of Transportation is in the process of identifying a consultant to do a comprehensive study of how much traffic would be diverted from Interstate 75, and environmental issues that could be created. We expect that to take the bulk of 2007, and after that we’ll implement a strategy. “It’s too soon to tell,” Martin says, but the most logical route would extend from Columbus to Tallahassee. “We’re not sure but it may be an extension of I-185 [from the junction with I-85 in LaGrange to Columbus],” he says. With nearly every county in South-west Georgia implementing or expanding tourism efforts, an I-185 extension could be a lightning rod for economic activity. Outside the town centers, agribusiness is strong: Worth County just announced that Con-Agra Foods is investing nearly $8 million in capital expansions, including the world’s largest peanut roaster. Alex McCoy, executive director of the Worth County Economic Development Authority, does not expect February’s salmonella outbreak, which resulted in a massive recall of Peter Pan and Wal-Mart’s Great Value peanut butter, both produced at the Sylvester plant, to change Con-Agra’s plans. At press time, the plant was shuttered and the incident was under investigation but, McCoy says, workers were still being paid. “[The new roaster] will allow them to add a third shift and go to a six-day production schedule, as well as create more capacity,” he says. The roaster could create 30 jobs over the next three to four years. The potential for entrepreneurship and economic expansion driven by tourism and retirees has not been lost on Southwest Georgia. New agribusiness growth includes spin-off companies encouraged by local and state authorities to start small and think big. “One local company, Automated Irrigation Controls, recently came up with a new watering control system,” McCoy says, adding that technology was recently showcased at the Ag Expo. Other local companies taking off include Southern Heritage Wood-works, which turns antique heart pine from old buildings, such as cotton warehouses, into flooring product. “They just started making furniture from scrap to cut down on waste, and met their two year employment goal of 21 in just six months,” McCoy says. Valdosta has placed a “big emphasis on encouraging growth of the creative class,” Ballard says. “We were the first community in the state to be designated Entrepreneur Friendly … . We also have a regional resource center called S.E.E.D.S. (Sowing Entrepreneur and Economic Development Success) which had almost 400 clients last year and yielded 36 new businesses,” she says. It also won Valdosta recognition as the state’s first Entrepreneur Friendly Community. The rising tide may be lifting a lot of boats, but this region is prepared. “If I didn’t live here, I’d move here,” Sims says.